Is Chickenpox Contagious? When are they most contagious? For parents, teachers, and children who have yet to experience the itchy, red rash known as chickenpox, the most important question would be, “Is chickenpox contagious?” This common childhood disease has symptoms of fever and fatigue along with the signature spots. Not to mention the extreme itchiness that never seems to go away. Chickenpox symptoms are worse when contracted in adulthood, although rare. There are vaccines available for both children and adults. We will look at whether the disease is contagious and how a similar disease known as shingles is related. Chickenpox is caused by the varicella-zoster virus, and yes, it is highly contagious. It can be transmitted through direct contact with an infected person by exchanging saliva. The chickenpox virus can also be contracted by indirect contact by sharing utensils and household objects. A cough or sneeze can also transfer the virus via airborne droplets. Newborns may contract the disease from their infected mother. The rule of thumb is that there is a high risk of contracting the virus by being in the same room with an infected person for 15 minutes. The same virus that causes the chickenpox outbreak is responsible for the painful condition known as shingles. By coming into contact with the fluid of a blister formed by shingles, the virus can be spread to those who have not been vaccinated. Once you have the virus, it can lay dormant within the nerve cells for years. Some cases see the virus reappear later in life as shingles. This usually happens after the age of 50. It should be noted that the varicella-zoster virus that causes both chickenpox and shingles is a human pathogen and cannot be transferred to family pets. How Long Are Chickenpox Contagious? Once a person has been exposed to or comes into contact with an infected person, the incubation period can be between seven and 21 days before symptoms appear. So, when are chickenpox contagious? The first two days before the rash appears up to five days afterward is the period when the person is most contagious. This explains why the disease is hard to contain in groups such as daycares and schools. Before the distinctive spots appear, symptoms of fever, loss of appetite, lethargy, and headaches usually develop. The red rash may first appear on the face and chest before spreading across the body. The infection is considered not to be contagious when spots stop developing, and the ones which have become dry and no longer secrete fluid. There will still be scabs for several days, but the infected person can return to their daily tasks without any concern of spreading the disease. The chickenpox virus can cause life-threatening conditions in newborns and pregnant women, as well as those who have immune diseases and cancer. 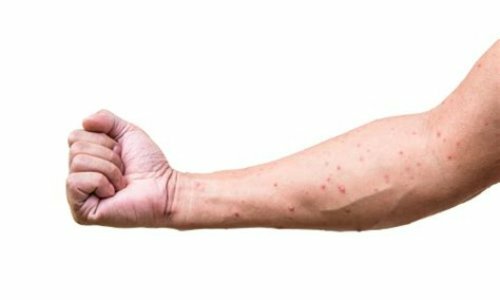 Although chickenpox and shingles are caused by the same varicella-zoster virus, these rashes have different properties. Shingles, referred to as zoster and herpes zoster, develops after the virus lays dormant in the nerve cells of the body after an outbreak of chickenpox. The reemergence of the virus is often seen with bouts of extreme stress in the later years or with an aged and weakened immune system. It should be noted that the exact cause for the development of shingles has yet to be determined. Furthermore, not everyone who has experienced chickenpox will develop shingles. While chickenpox is contagious and easily spread from person-to-person, shingles are much less contagious. Shingles cannot be contracted from an infected person, but the virus itself can be. And, someone who has never had chickenpox can develop the childhood disease from someone with the shingles outbreak. The two conditions present the same red spots, but a shingles rash can be severely painful and usually only develops on one part of the body. These spots can be extremely sensitive to touch. And, even clothing can send excruciating pain throughout the body, especially if the shingles are on the back or chest. Chickenpox is a contagious childhood disease that can also occur in adulthood in those who were never exposed to the varicella-zoster virus as a child. And, the trademark red spots appear after the virus is at the most contagious stage. Symptoms of a fever, headache, and fatigue that develop before the rash can mimic those of the common cold or flu. Once the itchy rash dries and scabs over, and no more fluid can be seen, then the disease is thought to no longer be in the contagious stage. Most children can return to regular activities in the public arena five days after the rash appears. The same virus will then lay dormant in a person for years and may emerge later in life as shingles. Davis, C., “Is Chickenpox Contagious?” MedicineNet; http://www.medicinenet.com/is_chickenpox_contagious/article.htm, last accessed August 2, 2017. “Chickenpox,” Child and Youth Health; http://www.cyh.com/HealthTopics/HealthTopicDetails.aspx?p=114&np=303&id=1853, last accessed August 2, 2017. Sifferlin, A., “5 Things You Should Know About Chicken Pox And Shingles,” TIME, January 29, 2013; http://healthland.time.com/2013/01/29/5-things-you-should-know-about-chickenpox-and-shingles/, last accessed August 2, 2017. “Chickenpox Incubation Period,” WebMD, February 27, 2017; http://www.webmd.boots.com/children/guide/chickenpox-incubation-period, last accessed August 2, 2017. “Facts about chickenpox,” Paediatrics & Child Health, September 2005; 10(7): 413-414; https://www.ncbi.nlm.nih.gov/pmc/articles/PMC2722564/, last accessed August 2, 2017.